Art.Science.Gallery. is proud to host The Buzz Stops Here, an exhibition of encaustic artwork produced in partnership with the International Encaustic Artists (IEA) about the science and conservation of bees. 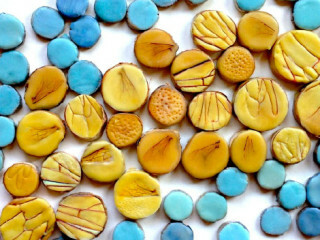 Encaustic is a painting method — also known as hot wax painting — which involves using melted beeswax. Each piece will speak to the science and conservation of bees, especially concerning the mysterious die-off of honeybee colonies. A portion of the proceeds from The Buzz Stops Here will be donated to the Sustainable Food Center in support of their new Teaching Apiary. The exhibition will be on display April 18 through May 30.